I can tell you with confidence that most of the coffee-drinkers in your life will not be disappointed with a holiday gift that includes a gift card to their favorite coffee shop – chain or otherwise – or a pound of some really good quality coffee beans. 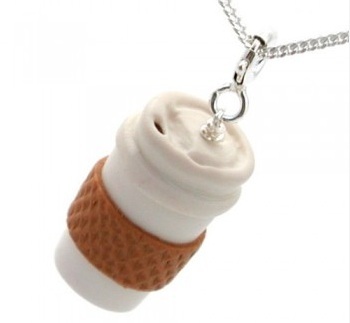 There are some ladies that you might want to get something a little more personal for, while keeping it coffee-related, you could easily opt for something along the lines of this very cute Take-Out Coffee Necklace. The pendant is completely handmade, from the lid down to the cardboard-like patterning on the tiny sleeve. The only thing it is missing is a tiny logo to brand it. It is made out of polymer, which is lightweight and perfect for everyday wear. I think that this is a great little stocking stuffer and definitely something that will get lots of admiring oohs and aahs from other coffee-drinkers. It’s not going to replace anything from Tiffany, of course, but then most of us are going to the coffee shop more often than out to a formal dinner anyway.